2012 Chevrolet Cruze 1.7 VCDi review | What Car? This is the Chevrolet Cruze 1.7 VCDi 5dr, which costs from 16,725 and is on sale now. The new model has a 1.7-litre diesel engine that averages 62.7mpg 12.3mpg more than Cruze 2.0 VCDi models, while CO2 emissions are 30g/km lower at 117g/km. 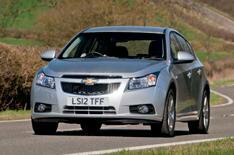 Styling tweaks for all Cruze 2012 models include new headlamp lenses, foglamps and alloy wheels. Inside, theres an updated centre console and a wider choice of seat fabrics. Initially, the 1.7 VCDi engine will be available in five-door versions of the Cruze only. Itll also be offered in the Cruze Station Wagon, which goes on sale in September. Whats the 2012 Chevrolet Cruze 1.7 VCDi like to drive? The new engine is smooth and usefully responsive. Performance is good, with 0-60mph taking a respectable 9.4 seconds. The Cruze is closely related to the latest Vauxhall Astra, but unfortunately its not as good to drive. The steering is light and responsive, but short of feel. Grip and handling arent a match for the best cars in this class, either, and the ride is often fidgety and unsettled. Theres little wind noise, but road noise can intrude at speed. Whats the 2012 Chevrolet Cruze 1.7 VCDi like inside? The Cruzes interior is spacious and smartly designed. The overall look is similar to that in current Vauxhall models, although the quality of materials isn't as impressive. Entry-level versions miss out on steering wheel reach adjustment, but the driving position is fine and there's decent head- and legroom up front. Rear legroom is good, but the sloping roofline means headroom is limited, and rear visibility is restricted. A chunky centre tunnel means space in the rear is tight for three. At least theres a good-sized boot, with 413 litres of space. Cruze 1.7 VCDi models cost between 625 and 885 more than the equivalent 2.0 VCDi versions, which have an extra 33bhp. Running costs will be substantially lower, however, due to the 1.7s superior fuel economy and CO2 emissions. Three trims will be available: entry-level LS comes with air-conditioning and stability control, while LT has extras such as alloys, electric rear windows and rear parking sensors. Top-spec LTZ models get cruise control, automatic headlights and wipers, and climate control. The new engine makes the Cruze more appealing as a company car and allows it to compete with 1.6-litre diesel versions of its key rivals. This is certainly the best version of the Cruze, but thats not enough to recommend it over cars such as the Ford Focus and Hyundai i30, which are classier, better to drive and cost much the same.